TS EAMCET 2019: Jawaharlal Nehru Technological University Hyderabad (JNTUH) is conducting TS EAMCET 2019 on behalf of Telangana State Council of Higher Education. As students gear up for the largest common entrance test of the state, here are 10 important details of the exam. Registration can be done at eamcet.tsche.ac.in. There are three steps – pay the registration fee that is Rs 400 for SC/ST and Rs 800 for all others, fill an online application, print filled in the form. The last date to submit the form without late fee is April 5, 2019. Thereafter last dates to submit the form with late fee of Rs 500, 1000, 5000, 10000 respectively are April 11, 2019, April 17, 2019, April 24, 2019, April 28, 2019. JNTUH has launched online mock tests at eamcet.tsche.ac.in. There is one each for E, and AM. to familiarize with the online test pattern, students can attempt this. Permitted mistakes in application form can be corrected during April 6, 2019, to April to 9, 2019. JNTU has released the online application form today for Telangana State Engineering, Agriculture and Medical Common Entrance Test, TS EAMCET, 2019. Jawaharlal Nehru Technological University-Hyderabad is conducting the common entrance test this time. The aspirants can visit the official website to register themselves for the entrance test. The common entrance test will be conducted on May 3, 2019. The official website is- tsche.ac.in. All the details are given below. The online submission of application forms: March 6 to April 5. The correction window to the online applications: April 6 to April 9. The engineering exam: May 3, 4 and May 6, 2019. Agriculture and Medical: May 8 and 9, 2019. Rs 5,000 and Rs 10,000, students will be allowed to apply Till April 24 and 28, the candidate is allowed to apply by paying fees of Rs. 5,000 and rs. 10,000 for general and SC/ST categories. Candidate should be of Indian Nationality or Persons of Indian Origin (PIO) / Overseas Citizen of India (OCI) Card Holders. Candidate should belong to the state of Telangana / Andhra Pradesh. The candidates should satisfy Local / Non-Local status requirements as laid down in the Telangana / Andhra Pradesh. Educational Institutions (Regulation of Admission) order, 1974 as subsequently amended. 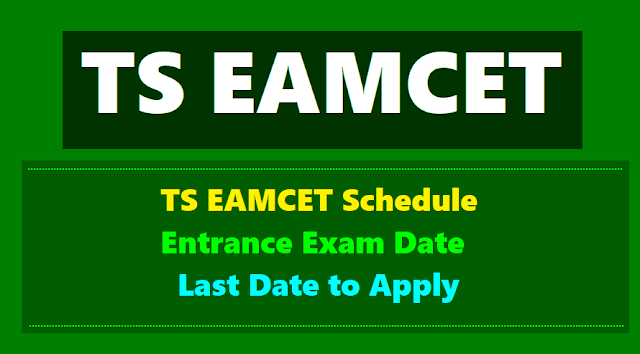 Courses offered: TS EAMCET 2019 is the gateway for admission to engineering, agriculture, and medical courses. Engineering programs through TS EAMCET are BE / BTech, BTech (Ag Engg, Bio-Technology, Dairy Technology, Food Technology), BPharm, Pharm D. Agriculture and Medical courses are BSc (Agriculture, Horticulture, Forestry) BVSc and Animal Husbandry, BFSc, BTech Food Technology), BPharm, BTech Biotechnology, Pharm D.
The common entrance test will be conducted on May 3, 2019. The official website is- tsche.ac.in. All the details are given below. For user guide go to the direct link. To avoid the unnecessary rush apply now. Exam pattern: The exam will be held in online mode as per the syllabus of EAMCET. Engineering (E) exam will have 80 questions in Mathematics, and 40 questions each in Physics, Chemistry, and Mathematics. Agriculture and Medical (AM) paper shall have 80 questions in Biology, and 40 each in Physics and Chemistry. Both are of 3 hours. There will be MCQs with single option correct. Students get 1 mark for the correct answer. There is no negative marking. TS EAMCET 2019 exam date: The Engineering (E) exam is on May 3, 2019, May 4, 2019, and May 6, 2019. Agriculture and Medical (AM) exam is on May 8, 2019, and May 9, 2019. Both exams will be held from 10 AM to 1 PM, and 3 PM to 6 PM. The language of the exam: Only those who get at least 25% marks qualify the exam. However, there is no set qualifying mark for SC/ST. Qualified candidates are ranked by awarding 75% weightage to normalized score of TS EAMCET and 25% to the relevant subject group in the qualifying exam. Why is TS EAMCET held? TS EAMCET is conducted every year by the JNT University Hyderabad (JNTUH) on behalf of Telangana State Council of Higher Education (TSCHE) for admission into various professional courses offered in University / Private Colleges in the state of Telangana. Admission to a number of bachelor degree courses like B.Sc. (Hons.) Agriculture, B.E. / B.Tech. - Bachelor of Engineering / Bachelor of Technology, B.Tech. (Food Technology (FT), etc are on offer through the exam. The Telangana government is going to announce schedule for fresh exam for admission to engineering and agriculture courses in the state. As per the new schedule announced by the Telangana State Council for Higher Education, EAMCET (Engineering, Agriculture, Medicine Common Entrance Test) will be held in May, from 10 a.m. to 1 p.m. The council appointed Jawaharlal Nehru Technological University (JNTU) registrar as the EAMCET convenor. The state will be conducting EAMCET for admissions to professional courses. The exam dates for the Telangana EAMCET (engineering, agriculture, medical common entrance test) have been released by the Telangana State Council of Higher Education (TSCHE), according to which it would be conducted from May 2 to 5, 2019. Candidates who clear the paper will be eligible for admission in BE, BTech, BSc courses in Agriculture and Technology at various recognised institutions in the state. Last year, the EAMCET paper was leaked twice and the exam was held three times. This year, the authority had ensured leak-proof exam and strict measures to prevent such irregularities is introduced. TSCHE has also released dates for other common entrance tests. ECET (engineering common entrance test) will be conducted on May 9 followed by TS ICET (integrated common entrance test) on May 17. - TS PECET (Physical Education Common Entrance Test): May ..
- TS LAWCET (Law Common Entrance Test): May ..
- TS PGLCET (Post-graduate law common entrance test): May ..
- TS EdCET (Education Common Entrance Test): May ..
All CETs, except TS-PECET will be conducted online. Notification Date: on March 02, 2019. Hall tickets: Downloading of Hall Tickets from the website: .....05.2019 to ....05.2019. 1) Candidates are required to download Hall Ticket afresh for appearing for TS EAMCET 2019.
a. The application form cost is Rs 800 for Others and Rs.400/- for Sc/ST Candidates for Engineering Exam. This time candidates can apply till two days before of exam date with late fee of Rs.10,000. But these candidates will be allotted centres at Hyd, Secunderabad only. 10-00 A.M. to 1-00 P.M. and 3-00 P.M. to 6-00 P.M. Exam centers: JNTU Hyderabad has identified 18 zones in Telangana and AP to hold the Common Entrance Test. Hyderabad has 5 zones, rest of Telangana has 10 zones, and AP has 3 zones. The exam will be held in a total of around 54 areas. In Telangana state total 13 cities are decided to conduct EAMCET , they are Adilabad, Janagoan, Karimnagar, Khammam, Mahaboobnagar, Medak, Siddipet, Vikarabad, Vanaparthy, Warangal and Hyderabad. Where Hyderabad consists of 8 centres. No centres are allotted in Andhrapradesh State. If they ask for centres then our govt will decide. This responsibility incharge is given to JNTU – Hyderabad. They are expecting that 2.5 lakh students may appear for this exam 70,000 from Andhrapradesh and 80,000 from our state. Rank of A.P students will be allotted as same as CBSE students allotted. If necessary we think of “Normalisation”. The Telangana State EAMCET Committee has decided to release a comprehensive schedule of EAMCET in April. The hall ticket numbers and the examination centres of the candidates as part of the fool-proof arrangements for the test. The candidates can download their hall tickets from May first week. A notification in this regard is expected in a couple of days, the officials informed.. So, get an idea of your inter exam and prepare for EAMCET also be clear with the date of exam, applying etc. Don’t fear of failure. Prepare with confidence victory is yours. All the Best.